Electron's reliable, inexpensive Mica Band heaters are best suited for uses involving low to moderate temperatures. 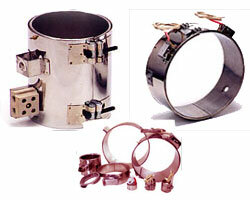 Mica Bands are also offered in a wide variety of termination and clamping styles. Electron's Mica Bands feature thin construction and high quality insulation for effective heat transfer and excellent dielectric qualities. » Max.surface load 25w/sq. inch. 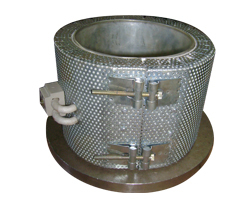 We are completely engaged in manufacturing of Mica Jacket Band Heaters. 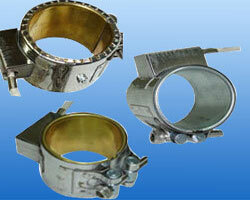 These are fabricated to meet the industrial heating requirements for high temperature. » Mica Jacket Heaters are Electron's Premium Product since so many yeears. » Maximum Sheath temperature upto 800 °C. » The Model is designed & constructed with special effect dual insulation which reduces the rate of heat rediation/loss, resulting swift rise in the temperature of the object to be heated. » Uniform heat distrubution throughout the barrel. 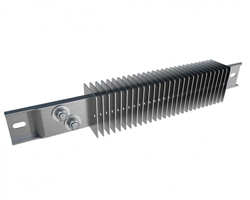 » Mica jacket heaters meet progressive equirements of plastic processors. Electron's mica strip heaters are constructed with the highest quality material available. A resistance element is wound around a sheet of mica, insulated on both sides with mica, and then a sheet of coated steel is folded around the composite layers of mica. These are made as per your design and requirement. 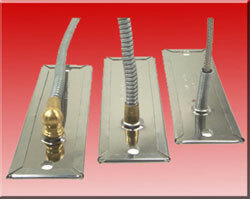 Finned strip heaters offer additional element surface for conduction of generated heat to air blast. It can be formed to concentraed heat. Fin Size 1.3/8" * 2 1/2". Also Available in ceramic insulation.